Over the course of college and grad school, I’ve found that the more important and intensive the research project, the more intensely I throw myself into other activities in the pauses. When I need a break, I need a really good break. Sometimes I take up running. Briefly. This week, I wrapped all my Christmas presents to take home, sewed most of my garb for Raglan 2016, and took up the production of sea glass sun catchers. BRID reads aloud: “To wish you a Merry Christmas and a Happy New Year”. I’ve been putting an exclamation point at the end to make it at least look like a sentence, instead of a weird small clause. NTS: creepy Santa chuckle. Ho, ho, ho. BRID, horrified: It’s like a syntactician’s worst nightmare. NTS: Tyrion Lannister in a Santa suit? NTS: A small Claus. Does Vaudeville jig. … Happy Thanksgiving? I guess kittens and espresso got too expensive. Or meat did. I hope you all had a wonderful Thanksgiving. I certainly did, thought it was spectacularly backward. On Thursday, I taught first years to draw syntax trees. (Some of them ask really good questions.) Then, since NTS was away for the evening, I stayed in my favorite uni cafe until 7 and cranked out some really solid work on the dissertation chapter I’d been struggling to write. Scottish/Italian/Asian fusion. Welcome to the great metropolis of Lanark. Friday I finished the draft of that chapter. W00t! I felt that I had really earned my Thanksgiving dinner. Then home to make ginger cranberry sauce (I will never served only canned sauce again) and sucre a la creme caramel sauce, which we ate on fruit, cookies and spoons (okay, that last was just me). Why the cranberry sauce? Because Saturday was expat Thanksgiving. Three Americans and, oddly enough, three kiwis. I think I can say were were all thankful to hang out for two days and enjoy delicious food in each other’s company. The official storefront of the Edinburgh Fringe Festival. Not the strangest thing you’re likely to see at the Festival. Happily, it’s still eight months away. UPDATE: Someone just slipped a truffle advert through my mail slot, with a sample. So much better than the usual unrelenting Virgin adverts. Also better than children burgers. It’s been a while, hasn’t it? Don’t worry, this blog isn’t going anywhere. I’ll even be posting in it again. I have an entire trip across Scotland to show you in pictures (the one that started here and here, if you’re keen to get going). In the meantime, here are five things to get you slightly caught up with my life in Scotland. My first academic article is appearing in a book next year! Grown-up problem: finding polite ways to request changes to your proof. Not subtle changes, those are easy enough. It’s the really, blindingly obvious ones that are hard to phrase. Also, fun fact: some research during this process revealed that some European languages don’t tend to differentiate between paragraphs with either an indentation (like a newspaper) or an extra return (like a blog). Nothing. Just a single carriage return. Mind blown by foreign typography. 2. Baskets. Because sometimes making rugs for a very small bathroom doesn’t use up your entire store of old clothes and sewing remnants. More details in a later post. 3. Conferences. Conferences are exciting and full of travel. (Some more than others; Birmingham vs. Brussels.) They are also full of panic as I bring my research into a presentable state. Sure, I started preparing for them a while ago. This has not stopped my panic. It turns out that research, like packing, always takes longer than you’re sure it will. But panic (of a certain kind) does get the job done. I expect that these conferences are the way my dissertation is actually getting written. No wonder my advisor is so keen on them. You see that yellow bit there? That’s my day. There’s maybe one more hour of twilight around 15:00, where that cloud is. Welcome to Scotland. 5. How does Scotland cope? For the past two days, I’ve been reading reviews and rebuttals of a paper written by a researcher scholar gentleman(?) whom I refer to in my head as that idiot*. His arguments are internally inconsistent and his methodology unsound; professional discretion forbids me saying more. Briefly put, he is a Bad Scientist. Right before I woke up this morning (when all my best and worst dreams happen) I dreamed I was at a conference lunch. At the next table the Bad Scientist (whose face was undoubtedly supplied by my subconsious, as I don’t know him) droned on to an awkward young researcher who was too polite to contradict him. Just as I was getting annoyed, the author of an impeccably-researched 30-page rebuttal set her tray down at the same table. Now, I thought, there will be fireworks. I started my day’s research in a considerably better frame of mind. * I suspect that developing professional antipathies is part of becoming an acadaemic. I once heard a lecturer refer to someone as “an absolute nutter of a historical linguist”. So, what did you think of [university]? Yeah, all those students walking around, talking about books. Every so often something happens to bring it home to me that at heart, I’m not so much a researcher as a scientist. Most often, this happens when I scoff at questionable research methodology. Or statistics abuse. Sometimes I have to remind myself that qualitative research is research, too. I have a feeling I’m going to be in for a shock when I move to another university and end up immured in the humanities. I’m pretty sure this is all just more evidence that every syntactician secretly wants to be a physicist, a condition known as physicist envy. 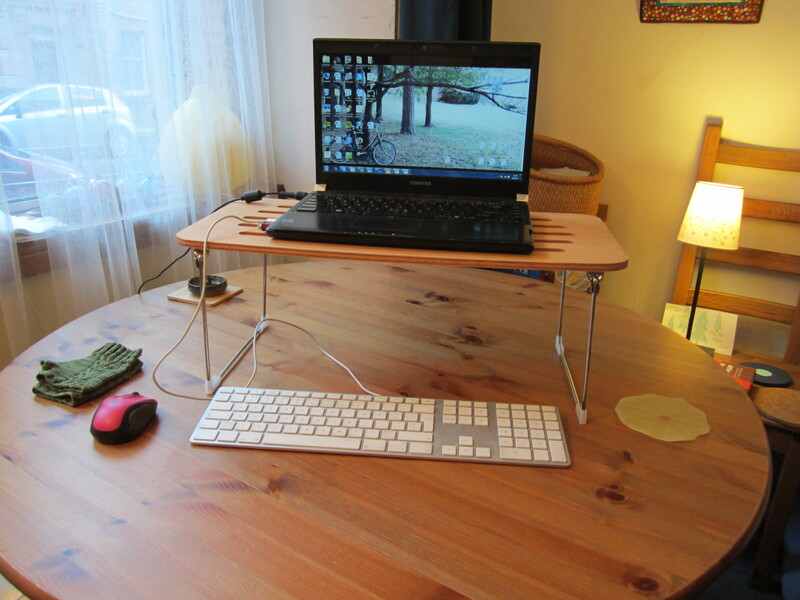 (Not quite the same as physics envy). How would a microfiche concordance of Old English even work? Basic corpus work was a lot more difficult in the past. “The time frame under investigation will be primarily the first millennium before and the first millennium after the birth of Christ.” Since I was translating, I did a double take here. Yes, it really said millennium. That’s a whole lot of ground to cover. We’ll see how that goes. In the same paper, I discovered that the change from BC to AD is called Zeitwandel in German, which translates to ‘timeswitch’. I don’t know why this doesn’t exist in English, and suggest we start using it forthwith. Low-carb and full of vegetables. More importantly, full of fresh mozzarella and balsamic vinegar. Usually I would just make caprese, but the tomatoes you get in January are just depressing. I’ve been writing my first-ever paper for submission to a peer review panel, so life has been busy lately. At least, there was was much sitting at the computer, if not always a lot getting done. But at least there was tasty food today. And tea. Combine everything; season to taste. I happened to pick up some fresh rosemary last week, so it’s been finding its way into everything. I regret nothing. Except not having an enormous rosemary plant of my own. 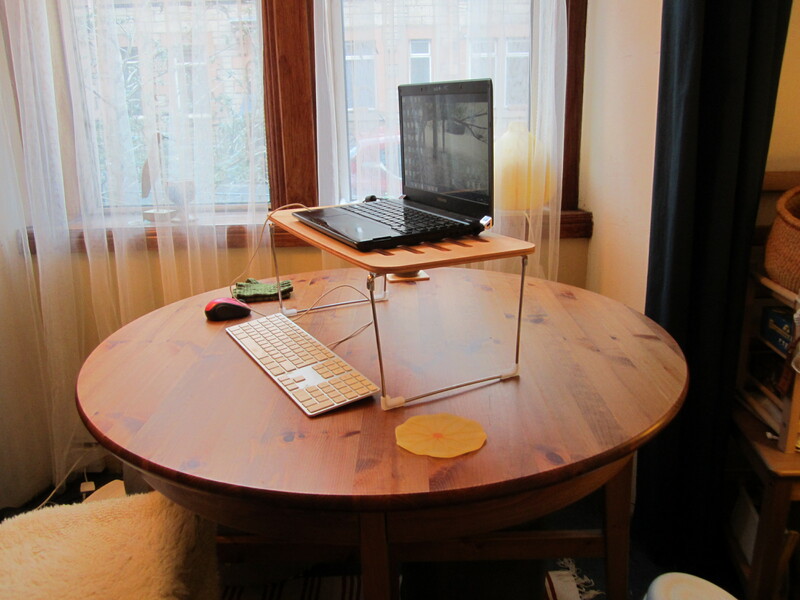 Also, I found a very simple riser for a pound, so my desk setup has become much more streamlined. And now NTS can have the lap desk back. 1. 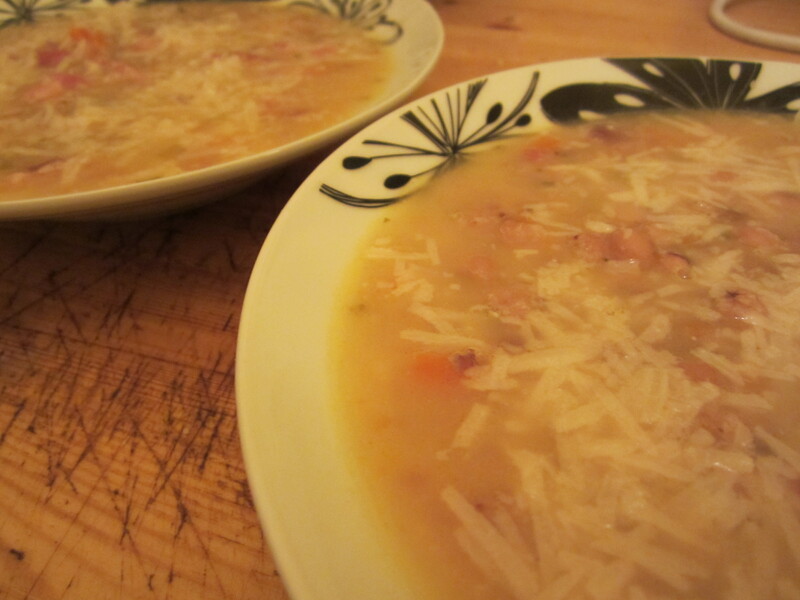 Tuscan white bean soup. Extremely rich; if you’re mixing bouillon from a paste, I recommend using about half the amount it says on the pot. 2. 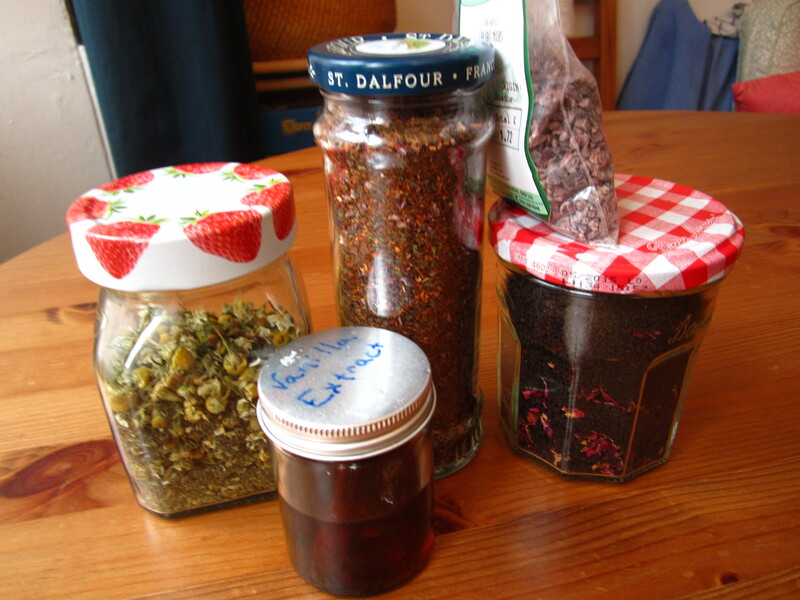 Home-made exotic teas. I’ve cut back on sugar and alcohol lately. Most of the time I don’t eat sweets or drink tasty, tasty mead because I want sugar or alcohol, especially; I just want something that tastes special. (Or I’m somewhere where the only food is junk food.) These teas taste special. 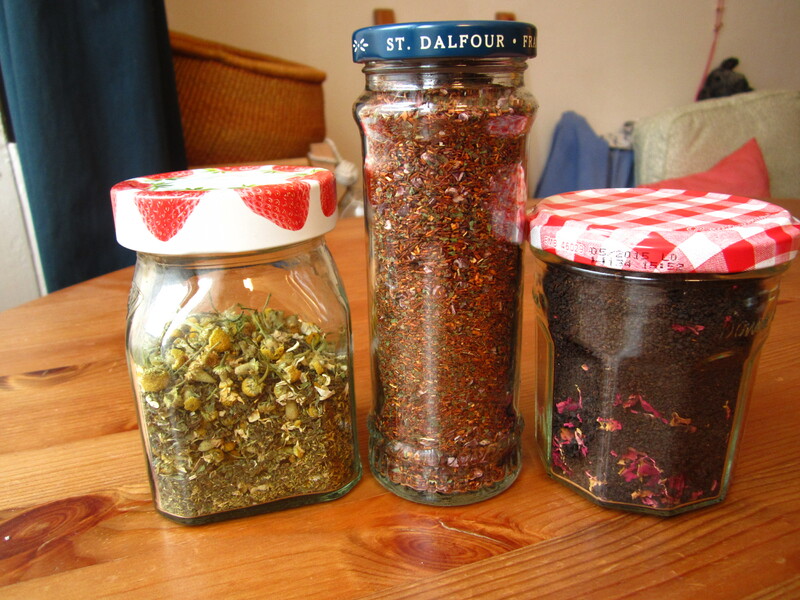 From left to right: Chamomile peppermint; red Christmas tea (red tea, vanilla, peppermint, cocoa nibs; recipe here); black vanilla rose. The ingredients mostly come from the local co-op, where I measure them out myself. 3. Showering by candlelight. Our tiny bathroom features a super-bright white light and a super-loud fan, plus the drone of the hot water machine. (Brits only sort of understand plumbing. Frankly, they’ve been resisting it ever since the Romans showed up with their baths.) Putting a candle on the one horizontal surface–the sink–removes the sensory overload and gets me ready for sleep. 4. Homemade chai concentrate. No sugar, and very tasty for homemade chai lattes. No thanks to: writing first drafts of conference papers. Because it’s easier to start writing if you perceive some sort of structure already in place. I don’t have to write a whole blog post at one go. I just have to write down five things. It doesn’t make sense to call ourselves ugly, because we don’t really see ourselves. We don’t watch ourselves sleeping in bed, curled up and silent with chests rising and falling with our own rhythm. We don’t see ourselves reading a book, eyes fluttering and glowing. You don’t see yourself looking at someone with love and care inside your heart. There’s no mirror in your way when you’re laughing and smiling and happiness is leaking out of you. You would know exactly how bright and beautiful you are if you saw yourself in the moments where you are truly yourself. I did try to find the attribution for this quote, but it remains elusive. I first found it on a blog called A CUP OF JO. 2. I held my last tutorials of the semester this morning. It’s strange knowing that after they left the room this morning, I would never see most of those students again. Next semester I’ll have another random 20 students out of 140, and next year they’ll be third-years and too old for tutorials led by doctoral candidates. I suspect this is a feeling I’ll have to get used to, as it will happen every semester for the rest of my life, more or less, but I don’t think I’ll ever get to the point where I don’t have at least a little pang at the end of every year. Along with the pang, though, comes a glow of relief that I will at last have an entire month to work on my research without interruption. Yes, that is the reason I look forward to the end of the semester. It turns out that your priorities really change as you get older. Like how kids think getting socks for Christmas is totally lame (unless they have penguins on them), but wool socks now feature high in my consciousness, and I’m salivating for–of all things–ultralight organizer bags for travelling. I’m not sure what my kid self would think of this, but grown-up me wants them desperately. 3. Blogs I’ve been reading lately: Reading My Tea Leaves, A Cup of Jo. 4. As you in the USA march toward Thanksgiving, here in Scotland I’ve almost finished my Christmas presents. I prefer to have the package in the mail by December 1, just to make sure it arrives in good time. I desperately want to show you the presents I’ve made, but they must remain secret. As the holiday approaches, I may weaken and show you the Christmas cards. They’re so pretty! And such a process it was. It would have been faster, surely, and almost as cheap, just to buy cards. But they wouldn’t be half so pretty. 5. Speaking of which, I’ve been tasked with compiling lists of gift suggestions for NTS and myself. I’ve got some things on the list (organizers, w00t! ), but I want to include some non-object items, as well. I would say, “don’t give me anything this year,” but frankly, I love both giving and receiving presents. And the people dedicated enough to send presents all the way to Scotland have very good taste. But I suspect experiences will fit into my flat better than most objects. Reading My Tea Leaves talks about this and other tips for minimalist gift-giving in a recent post. I rather like her want, need, read, do checklist. Help a sister out. What are your favourite experiences (tickets, foods) to give to your loved ones at Christmas?